A hobo spider bite is something that needs to be taken seriously, if anecdotal reports are to be believed. Although there is a lack of official data to support these anecdotal reports, hobo spider bites on rabbits have produced necrotic lesions, similar to those produced by brown recluse bites. The hobo spider is not as well known as the brown recluse or black widow spiders, but it is more aggressive. 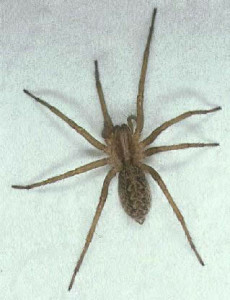 The hobo spider is more prone to biting humans than many other spiders. The hobo is also known as the “aggressive house spider” for this very reason. If a spider bites you without provocation, the chances are it is a hobo spider. A bite from the hobo spider usually occurs because the spider felt compelled to attack the human. They can be aggressive, particularly with provocation, for example if they have been squeezed, or startled, or if the spider is a female protecting an egg sac. The following table outlines identification of a bite from the hobo spider, and hobo spider bite symptoms. The bite typically looks like a mosquito bite and may feel like one in the first 24 hours. It has a reddened area which may be a few inches in diameter and may feel numb. A blister will develop within 48 hours of the bite and, when the blister breaks, a necrotic lesion will form wherein there will be scab or eschar formation and ongoing tissue destruction underneath. In some cases, the scab will fall off and expose an ulcer which may take several weeks to a few months to heal, exposing the bitten human to infection. The non-healing ulcer may be range from pea-sized to larger than a half dollar coin. The bite is generally painless at first, but it can become serious. After a few hours, the bite will get inflamed and may be accompanied by a headache, which can be very intense. Some cases report the presence of nausea, fatigue, weakness, vision impairment and temporary memory loss. Muscle pain and ache may also occur. The bite is venomous but is non-fatal. The symptoms vary from person to person. However, it is wise to note that only half of the bites produce symptoms, as about half of the cases are dry bites – these are bites where no venom is injected and therefore do not produce symptoms. If the bite produces a lesion, it might become infected and medical attention will be needed. After proper identification of a hobo spider bite has taken place, it is best to provide first aid. If it is too late for first aid, manage the treatment of the bite at home. 1. Clean the wound by washing it with soap and water. Alcohol or antibiotic ointment can also be applied. 2. Apply an ice or cold pack to minimize spread of the venom. Elevation of the bite site can help minimize venom damage as well. 3. Monitor the progression of the wound appearance and any symptoms. 4. If more severe symptoms than those discussed in the table above appear, it is best to seek medical help. The most reliable way to accurately identify a hobo spider bite is to get a good look at the spider itself. The hobo spider is typically found outdoors and seldom inside the home. It is originally from Europe but has spread to some parts of the west coast of the United States. The hobo spider is believed to have been introduced to the United States by boat in the 1920s and has since adapted to urban living. The hobo spider can be difficult to identify because its appearance can have many variations. The most reliable identification mark is the light mark on its sternum. Also notable is the absence of dark bands on the legs which a lot of other spiders have. It also has a chevron pattern on the middle of its abdomen but this is not usually easy to see unless the spider which caused the bite is captured. A male hobo spider is very distinct from a female due to the appearance of its swollen palps which are filled with sperm. They are often mistaken for fangs by those who are not familiar with spiders. A hobo spider bite typically happens when a human disturbs its web, or around mating season when males will often run along the ground in search of a female. They are known to walk over humans around this time as well, making the possibility of a bite higher than usual. Hobo spider bites are one of the most feared spider bites, however, a bite from a hobo spider is not fatal and can be taken cared of at home. With the knowledge of how to identify it and manage its treatment, a bite from the hobo spider is not usually much to worry about.